A qualified robotics speaker does many things – informs people who are less familiar with robotics, relays information about the benefits, and entertains. This can be a tall order, and that’s where short robot specialist Dr. Joanne Pransky comes in. Named by Isaac Asimov himself as “the real Susan Calvin” in the late 80s, Dr. Joanne is the World’s First Robotic Psychiatrist®, and a professional robotic expert and speaker. She’s appeared on The Tonight Show with Jay Leno, CNN, Comedy Central Sports Presents BattleBots, the SyFy Channel (back when it was still the “Sci-Fi Channel”), and more. So what, exactly, is a robotic psychiatrist? This was Joanne’s tongue-in-cheek way of illustrating our civilization’s movement toward a time when intelligent and sentient robots are so much a part of our daily lives that we become emotionally attached to them and, like we do with our pets which we often ascribe human thoughts and feelings to, we may have to take our robots to a ‘shrink’ to adjust their behaviors and responses to us humans. That time is rapidly approaching, and we’re already experiencing robots becoming a part of our common landscape, as automated vehicles, bartenders, and surgical aides. As an engaging robotics speaker, she works to bring more of these new mechanical workers and companions into the public eye in an affable way. Since the 1980s, Joanne has worked as a robot specialist and consultant for many major robotics and entertainment companies, including Motoman, Robotic Industries Association, KUKA Robotics, Staubli, Summit Entertainment, and DreamWorks. 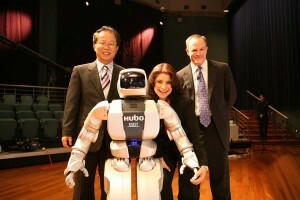 Her humor and ability to create relatability between robots and humans is a powerful tool in bringing the general public around to the idea of collaborating with their new electronic counterparts. Much in the way wildlife expert Steve Irwin demystified some of the most dangerous and feared animals on the planet through his infectious enthusiasm, Dr. Joanne works with organizations to pave the way for a warm reception to all sorts of robots, even among luddites. For more information or to book Dr. Joanne Pransky as a robotics speaker for your next event, please contact her now.